The best part of Ashes of Twilight is the writing. Tayler's style suited me well, with pretty sentences and just enough slang that I guessed the book was set in England. By the end of the book, I marked down several quotes I enjoyed. Tayler has a mature writing style, with no abuse of sentence fragments. Wren MacAvoy wants more out of life. Born a shiner, she climbs out of the mines every day into the more dangerous reaches of her domed world to speculate on what's above. The rulers say that flames fill the world outside, making the dome a necessity, but she does not think she sees flames out there. Wren is a seeker, curious and unwilling to settle for anything, most especially a life she's been told to live and a boy she's been told to marry. While I did enjoy Ashes of Twilight, I really wish there had been more to it, something unique. None of the elements herein were unfamiliar to me: the dome, the class hierarchy punishing to those on the bottom-most rungs, the terrible air quality, the mining, the instalove, the abusive guy who wants to marry Wren, the twist regarding Wren's father, or the plot arc. All of this I have read in other dystopian novels, not all together like this, but I would still hope to see something solely of Tayler's creation. I have read a lot of dystopian novels, however, so this might not be an issue for readers without so much knowledge of the genre. Perhaps the worst element is the relationship between Wren and James. He sexually assaults her in an attempt to force him into marriage, and, though she does get mad about that and doesn't fall in love with him, she's too forgiving. Later in the book, she emphasizes multiple times what a great guy he is and that she thinks he'll make some other girl very happy. This reaction makes me VERY uncomfortable. 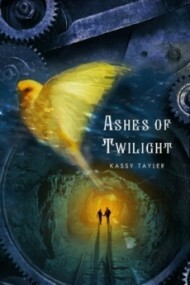 Ashes of Twilight does have rather a slow pace, but, if you do not mind that, you might enjoy this book. Tayler's debut might work better for those without too much familiarity with the dystopian genre. I probably will try the next book in the series, with hopes of seeing Tayler really break the mold.